This week is LEGO Week so we have dozens of cool ideas that we are sharing along with some of our favorite bloggers! We have been dying to play with kinetic sand... and so we finally did this week! I don't know how we waited so long... the stuff is seriously amazing. 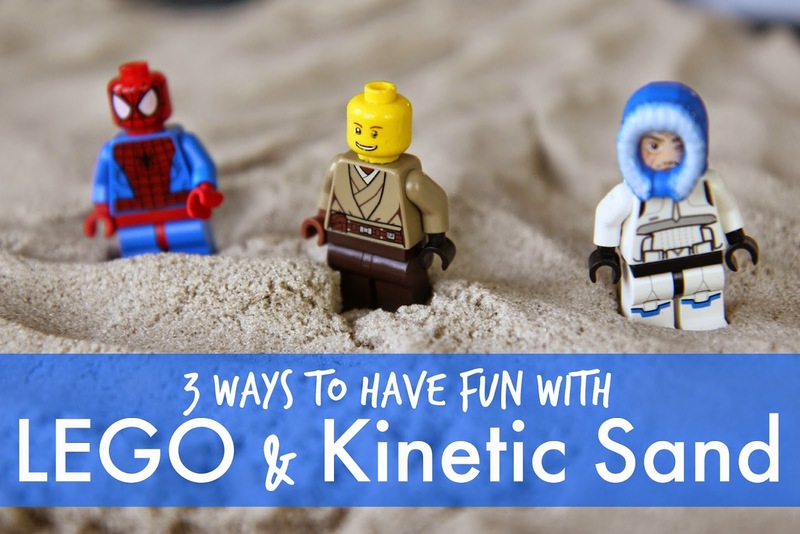 Today I am excited to share three ways you can play with kinetic sand and LEGO! Probably the first thing you need to do is either buy or make kinetic sand. We decided to buy our Kinetic Sand on Amazon from Wacky-tivities. It was excellent. Growing a Jeweled Rose shares a DIY kinetic sand recipe you could make if you prefer. In order to play with our LEGO guys and the kinetic sand we first spread out the sand on a rimmed baking sheet. I only had one package and am now ready to go buy a package for each of my three kids... and one for me! It is that cool. We started off by grabbing our favorite minifigures and bringing them down to play in the kinetic sand. They walked around, made prints, and then got hidden! Hide and seek in kinetic sand with minifigures was a HIT! One kid would break the minifigures apart and then hide each of the pieces throughout the sand on the baking sheet. Then the next child would go and dig through the sand to find all of the minifigure pieces and then reassemble them! Putting them back together was kind of like a little puzzle. After that, the next kid would break them all apart and hide them, and the next kid would get to find them. The game was actually a great way to practice taking turns and oh boy did my kids have fun trying to find the hardest places EVER to hide the minifigures... in the kinetic sand. It was hysterical. We played this game for FOREVER. 2. Stamping with LEGO in kinetic sand. Next we worked on stamping with LEGO in kinetic sand. You can find more details about Kinetic Sand LEGO Stamping over on And Next Comes L. We did a similar activity printing with playdough and LEGO and the kids loved it... so of course we had to try it with kinetic sand too! 3. LEGO Imprint Matching Game with kinetic sand. We also had fun using regular LEGO and LEGO duplo and making marks in the kinetic sand. We tried out Mama Papa Bubba's idea of doing a LEGO Play Dough Imprint matching game but instead we used kinetic sand! It was awesome! Pop over to Mama Papa Bubba's post to check out the full tutorial of their LEGO Play Dough Imprint matching game and use kinetic sand instead. Have you ever tried out kinetic sand? Have you ever used it with LEGO? One tip is to make sure you have toothpicks on hand... if any sand gets in the minifigs, but it is super easy to get out with toothpicks. We have loads of other Thursday LEGO Week activity posts to share with you too! 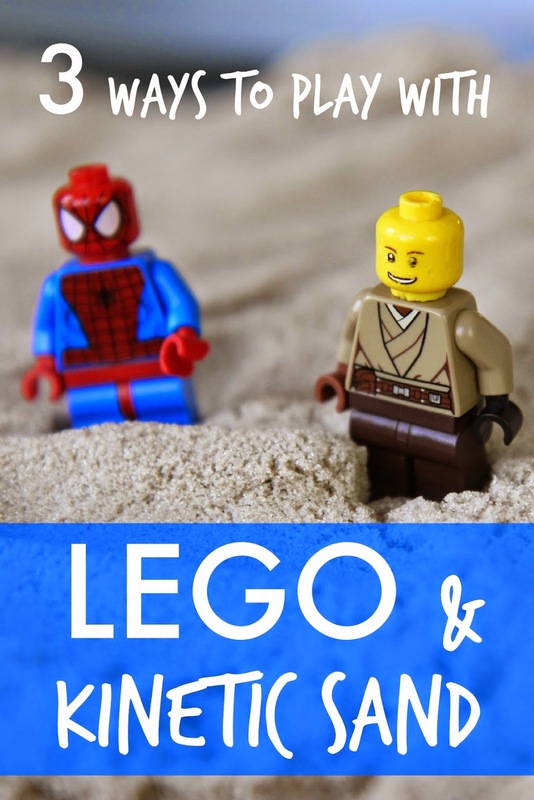 You can catch all of the posts from this series on our 2nd Annual LEGO Week landing page. Love this. We don't have the sand yet but you may have convinced me to give it a go when you combined it with LEGO. Neat :) sharing.